If a player from the kicking team is the first to touch the ball after it crosses the line of scrimmage, "illegal touching" is called and the receiving team gains possession at the spot where the illegal touching occurred. This is often not considered to be detrimental to the kicking team; for example, it is common for a player on the kicking team to deliberately touch the ball near the goal line before it enters the end zone to prevent a touchback. Since there is no further yardage penalty awarded, the kicking team is often said to have "downed the ball" when this occurs (and the NFL does not count it as an official penalty). While the ball is not automatically dead upon an illegal touch, and can be advanced by the receiving team (who would then have the choice of accepting the result of the play or taking the ball at the spot of the illegal touch), this rarely happens in practice, as illegal touching typically occurs when members of the kicking team are closer to the ball than members of the receiving team. In the NFL, this is referred to as "first touching," and is considered a "violation," and cannot offset a foul by the receiving team. 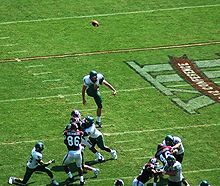 Moreover, kicking team players are allowed to bat the ball back into the field of play so long as they have not touched the goal line or end zone, even if their bodies enter the air above the end zone; in such cases, the ball is spotted from where the player jumped or the 1-yard line, whichever is farther from the goal line. 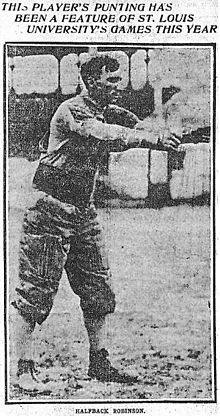 Alex Moffat is generally recognized as the creator of the spiral punt, having developed it during his time as a college athlete in the early 1880s. It is the longest type of punt kick. In flight, the ball spins about its long axis, instead of end over end (like a drop punt) or not at all (like a regular punt kick). This makes the flight of the ball more aerodynamic, and the pointy ends of gridiron footballs mitigate the difficulty to catch. Teams may line up in a normal offensive formation and have the quarterback perform a pooch punt, also known as a quick kick. This usually happens in situations where the offense is in a 4th and long situation in their opponent's territory, but are too close to the end zone for a traditional punt and (depending on weather conditions) too far for a field goal try. Like fake punt attempts, these are rarely tried, although Randall Cunningham, Tom Brady, Matt Cassel and Ben Roethlisberger have successfully executed pooch punts in the modern NFL era. Some pooch punts occur on third down and long situations in American football to fool the defense, which is typically not prepared to return a punt on third down. The longest punt in North American pro football history is a 108-yarder by Zenon Andrusyshyn of the CFL's Toronto Argonauts (at Edmonton, October 23, 1977). This record was also tied by Christopher Milo of the Saskatchewan Roughriders on October 29, 2011, at a home game at Mosaic Stadium at Taylor Field in Regina, during which winds gusted above 35 miles per hour (56 km/h) (this is also the site of the three longest field goals in CFL history and one of the windiest fields in professional football). A punt return is one of the receiving team's options to respond to a punt. A player positioned about 35–45 yards from the line of scrimmage (usually a wide receiver or return specialist) will attempt to catch or pick up the ball after it is punted by the opposing team's punter. 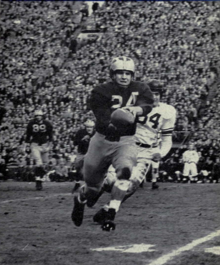 He then attempts to carry the ball as far as possible back in the direction of the line of scrimmage, without being tackled or running out of bounds. He may also lateral the ball to teammates in order to keep the play alive should he expect to be tackled or go out of bounds. DeSean Jackson, then playing for the Philadelphia Eagles in the " Miracle at the New Meadowlands", is the only NFL player to return a punt for a game-winning touchdown on the final play of regulation. The NFL record holder for the number of punt returns for a touchdown in a career is Devin Hester with 14.